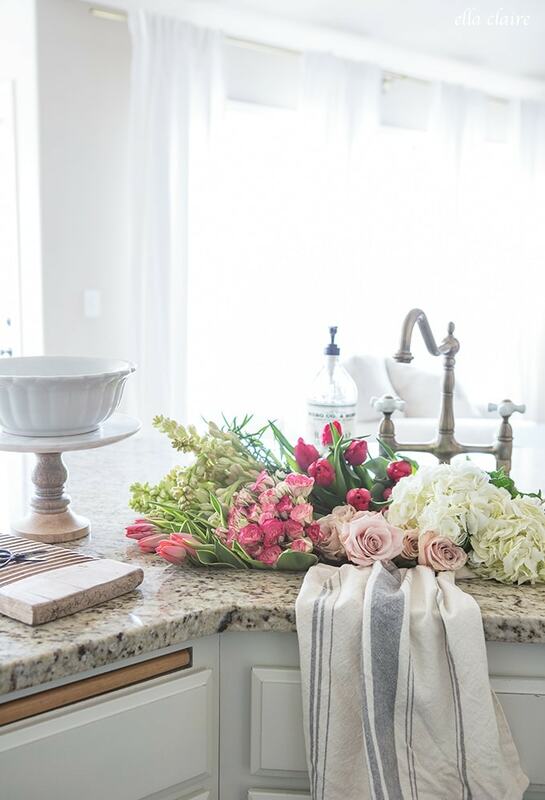 While this post is in collaboration with Hobby Lobby, all design ideas, photos, and projects are mine. 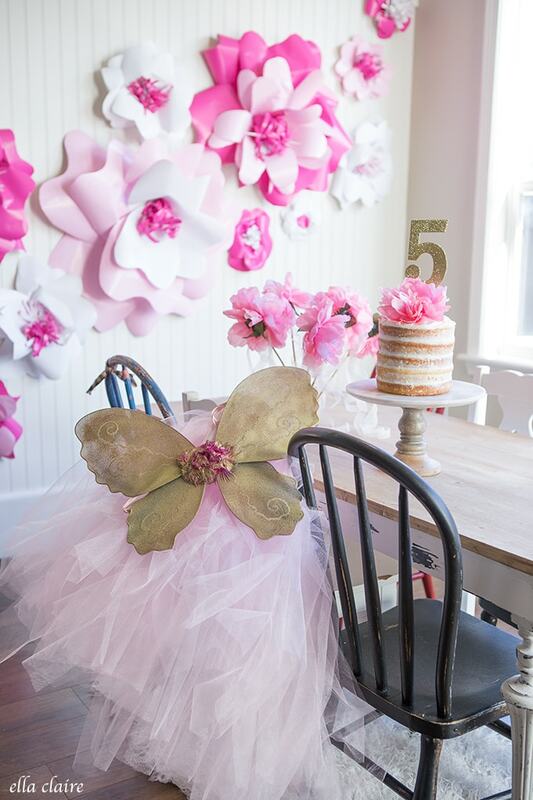 Over the summer my Ella had her 5th birthday and she knew exactly what theme she wanted for her party- fairies and lots of pink. She is so enamored by fairies and loves to read books about them, work in her little fairy garden, and write letters to her tooth fairy. She is so sweet and I never want this magical phase to end. While I snapped pictures of her and her cute friends, I didn’t get many shots of our fun activities. 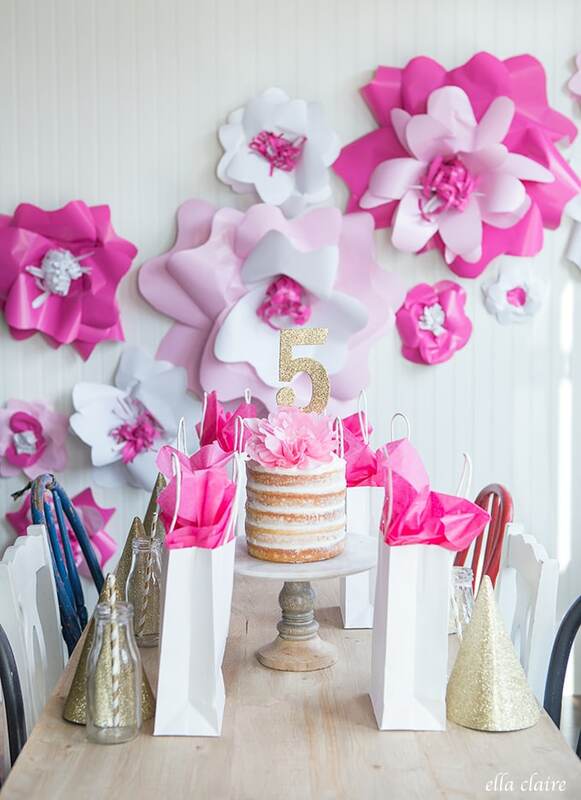 When Hobby Lobby challenged us to create a party for under $100 I thought it would be the perfect opportunity to recreate some of the decor and projects that I did with the girls and share them with you. She loved them so much the first time around and was thrilled to get to do them again. I will have to share some more of the detailed DIY pics in other posts because there were so many, so stay tuned. 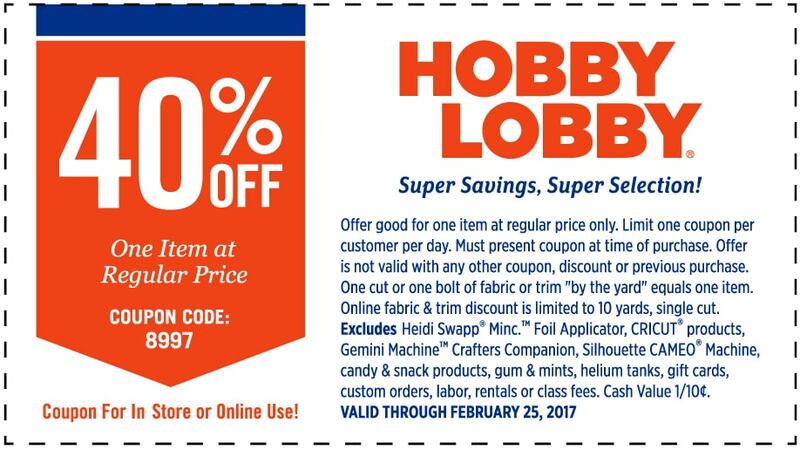 I will also share a detailed list of all the Hobby Lobby items and where you can find them at the end of this post for your convenience. I started by making this cute little fairy outfit for Ella so I grabbed a pink t-shirt, fairy wings, and 3 rolls of pink tulle ribbon. I cut the tulle into as many lengths as I could get out of the 3 rolls and then tied it in knots along a length of ribbon I had in my stash which created such a fun, full skirt. She squealed when she saw it! 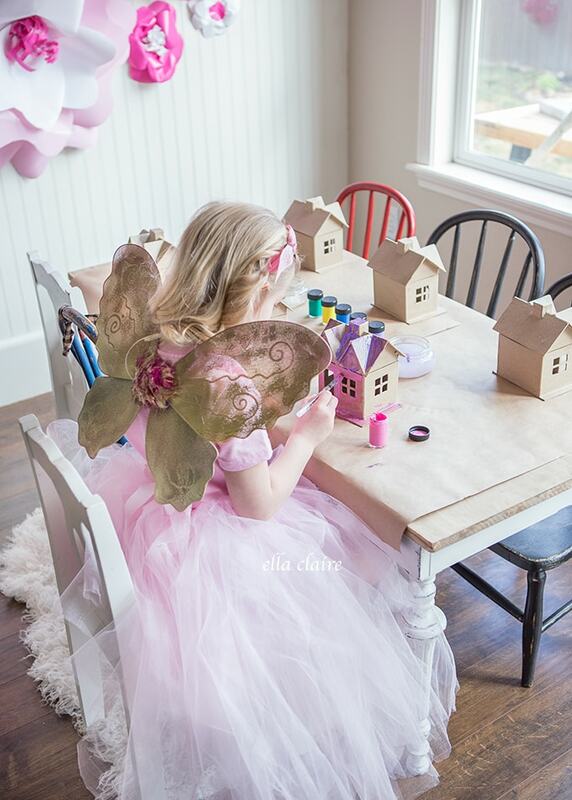 The fairy wings were originally rainbow colored which didn’t match our little theme, so I just used my 40% off HL coupon and spray painted them with metallic shimmery gold spray paint (you can find the coupon HERE). And what fairy outfit would be complete without fairy wands? 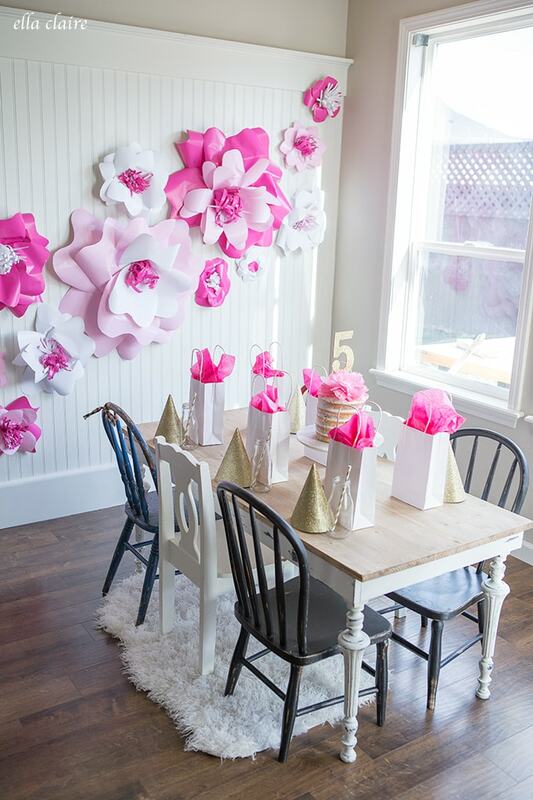 I used the gold spray paint to spray some sticks that I had in my stash and glued on these sweet pink peonies. I tied on a couple lengths of ribbon to add a little whimsy. Ella loves crafts and creating, so I wanted to do a couple of projects with the girls. 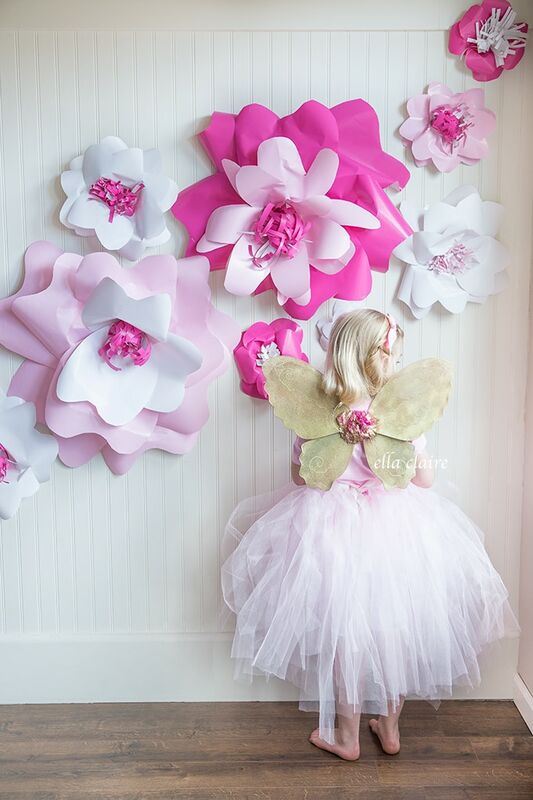 First, she helped me make all of these big fun flowers from wrapping paper and I loved how they turned out. I think they are so whimsical! 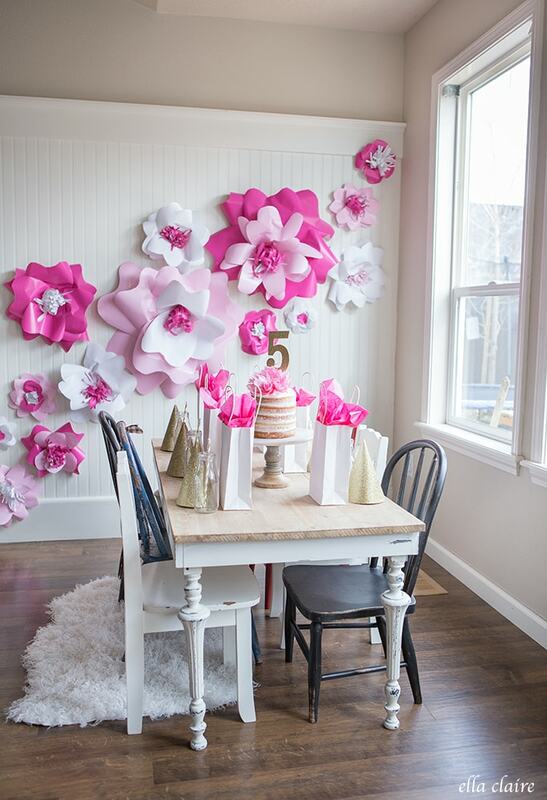 Cut petals in varying sizes out of dark pink, light pink and white wrapping paper. Make a slit at the base of each petal (like I did here), overlap and glue using a hot glue gun. use a scrap piece of cardboard as your flower base, and begin to hot glue petals around the base. Continue to layer petals until you reach the desired look. cut small slits into a length of wrapping paper, roll up and glue to center of flowers. 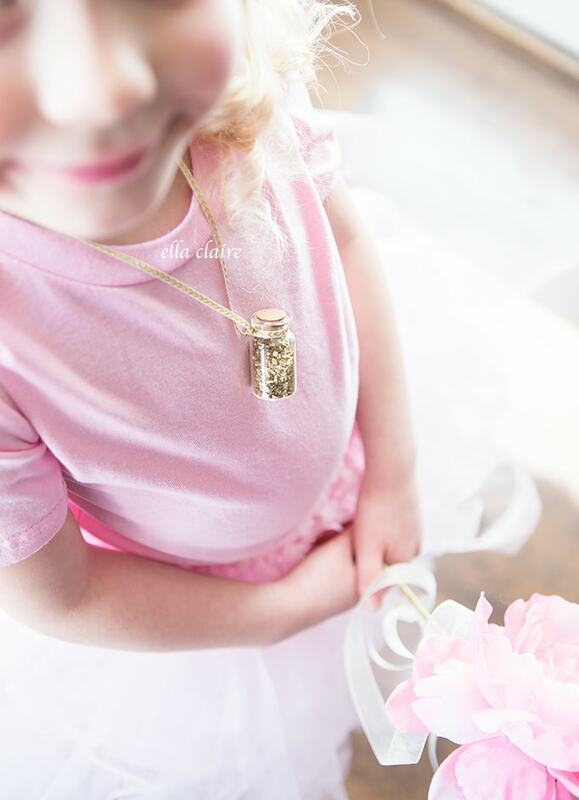 My very favorite thing we made were these little necklaces filled with fairy dust. Ella had written a letter to her tooth fairy asking her for a very special favor- to send magic fairy dust for her birthday party. 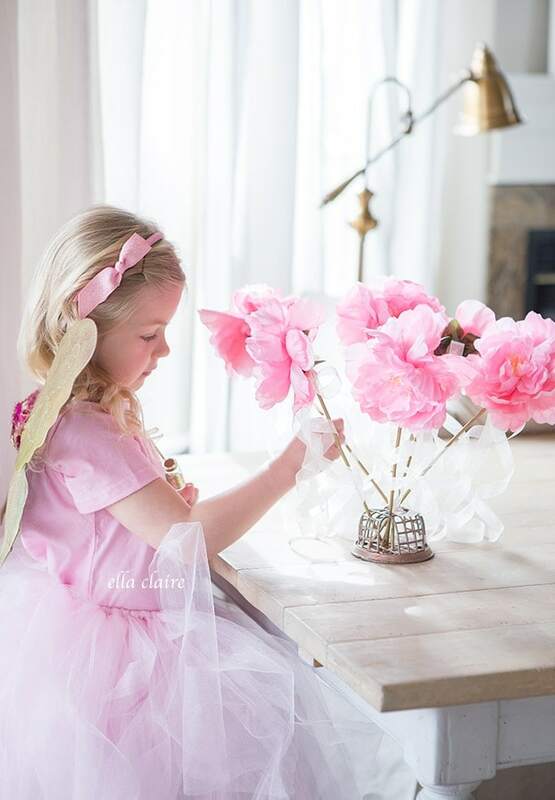 The very next morning, she found a bottle of magic fairy dust in her windowsill with a letter from Sparkle Flower (her tooth fairy) wishing her a happy birthday! 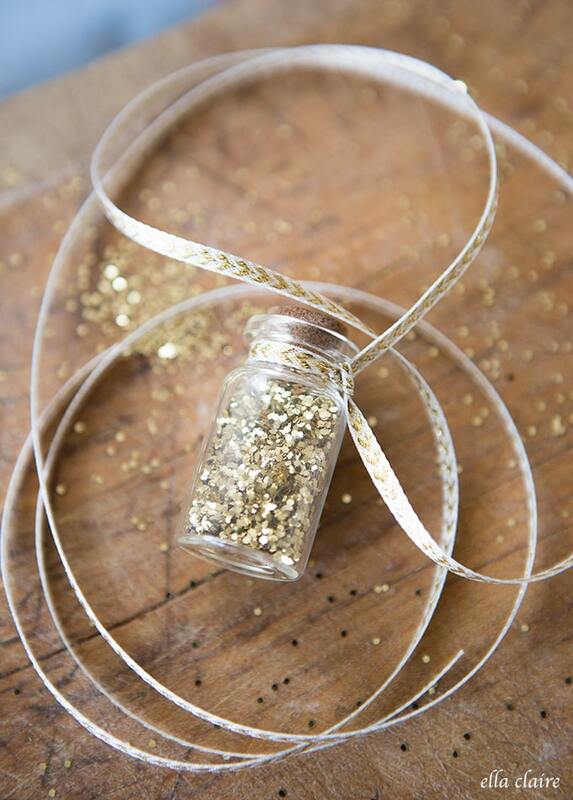 For moms that are in a bind- I hear that you can also get bottles of magic fairy dust at Hobby Lobby :). I took each of the girls out into the grass under a tree in our backyard and Ella shared her fairy dust with each of them while they made sweet little necklaces. 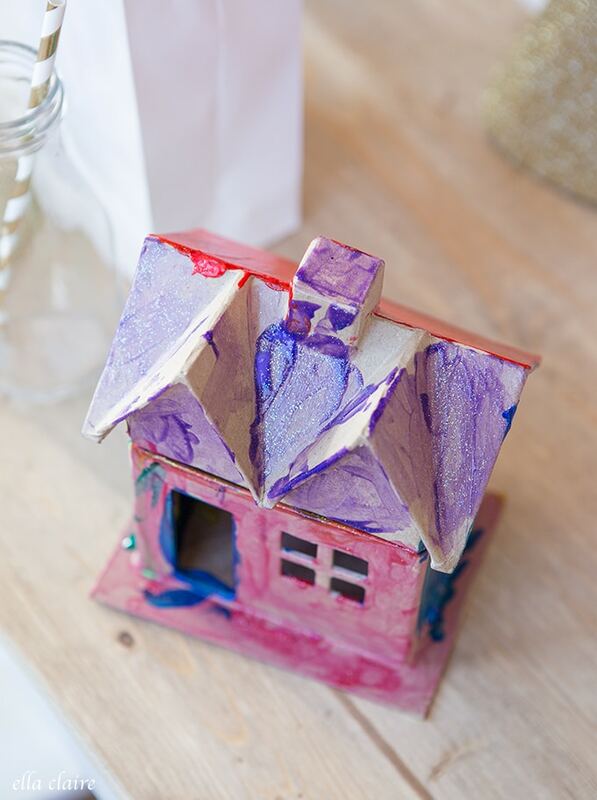 We also painted sweet little fairy houses. Ella has a fairy garden outside, but she put this one under her bed in case any of the fairies who visit her room want a place to play. 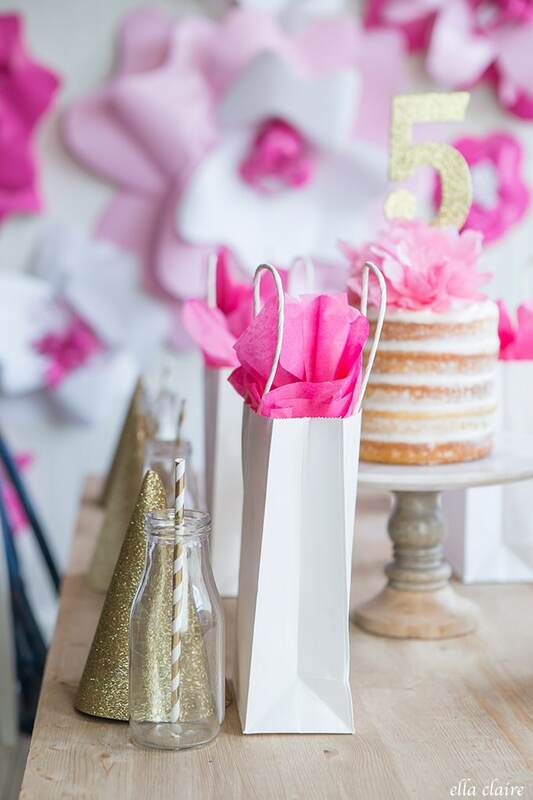 I had so much fun picking out our party paper goods and was in love with the glittery and gold items I found- the party hats, striped straws and this adorable cake topper. 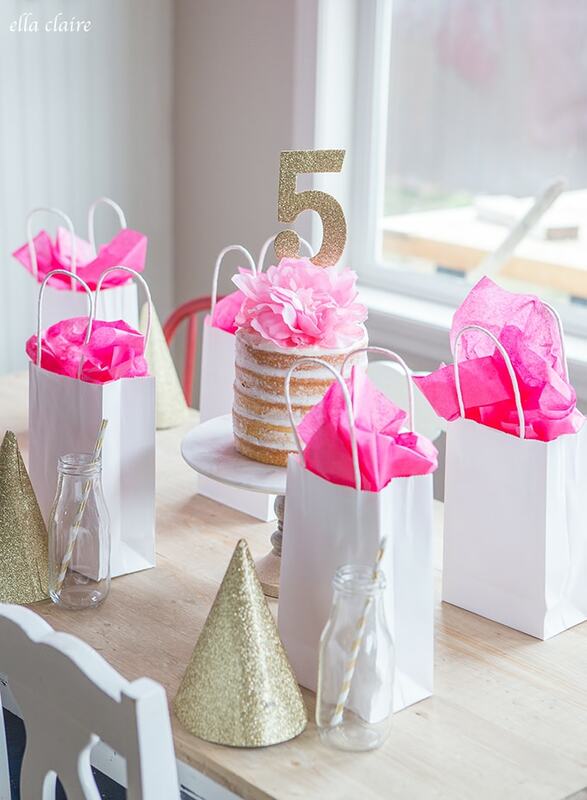 I kept the party favors simple because there were so many crafts to take home, so I just put a homemade cupcake in each bag with tissue. I love this color combination mixed with the gold glitter. We had so much fun recreating her birthday party and she is convinced that her birthday should be a monthly occurrence. I love birthdays and parties, so I wouldn’t mind that one bit! The whole party came in under $100 and here is a breakdown of the items I used, their cost, and where I found them at my store to hopefully save you time! Everything you see is from Hobby lobby except for the furniture, cups and antiques from my home.